If there is one constant in the art world, it's change. A new show at the Walker Art Center in Minneapolis examines how interpretations of five mainstays of artistic expression have changed over the years. The exhibit, titled "Five Ways In: Themes from the Collection," features more than 100 pieces. Senior curator Siri Engberg said the center has a lot of work in storage. "It's 13,000 objects," she said. "So by the standards of some contemporary art museums, we are sort of on the small side. We are just a slice of one department at the Minneapolis Institute of Art, for example." But that is still a lot of art to consider when choosing pieces for a show. The gallery walls are a riot of color, and sound from the video rooms echoes through the Walker. Having that "Five Ways In" list did help Engberg a bit with making choices. "Starting with the landscape, the second section is interiors," said Engberg. "Portraits, artworks that use the everyday as a theme, and then abstraction." And Engberg began with a specific list of people. "Actually, I started thinking about the checklist first by looking at all the women in the collection," she said. Then it was just a matter of fleshing out the show with interesting examples. She also wanted to show pieces that hadn't been publicly displayed for some years. That included a dramatic large-scale painting by Joan Mitchell called "Posted." It can be interpreted as an abstract, but it's part of the outside section of the show. Several pieces fit into a number of the categories. 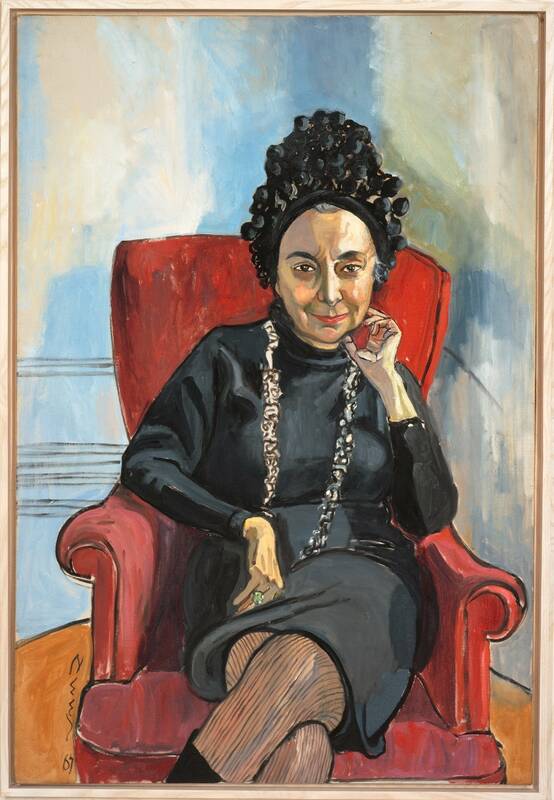 Engberg pointed to a large photograph by Minneapolis artist JoAnn Verburg. "It is a landscape, a portrait and a still life — all at once," she said. At first glance it's a peaceful scene: A man sits reading a newspaper in a sunny garden ringed with brightly colored blooms. "What's happening really in the picture, on this kind of quiet morning, reading the paper, is that that's the newspaper on the morning after 9/11," said Engberg. "So there is an incredible sadness and weight and severity to the situation." Verburg is just one of many Minnesota artists in the show, including George Morrison, Frank Big Bear, Alec Soth, Ta-coumba Aiken, Frank Gaard and Wing Young Huie. They hang beside pieces by Warhol, de Kooning and Georgia O'Keefe. 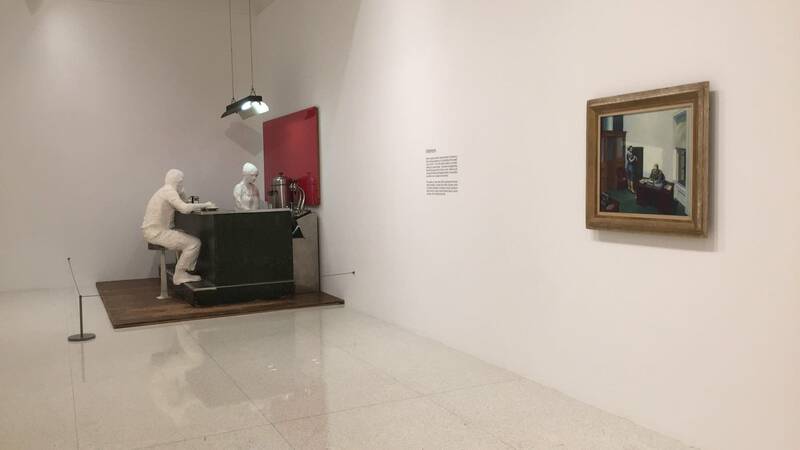 At the entrance to the portraiture section, two more pieces that have not been shown for a couple of decades greet visitors: Edward Hopper's atmospheric 1940 painting "Office at Night" and George Segal's sculpture "The Diner." 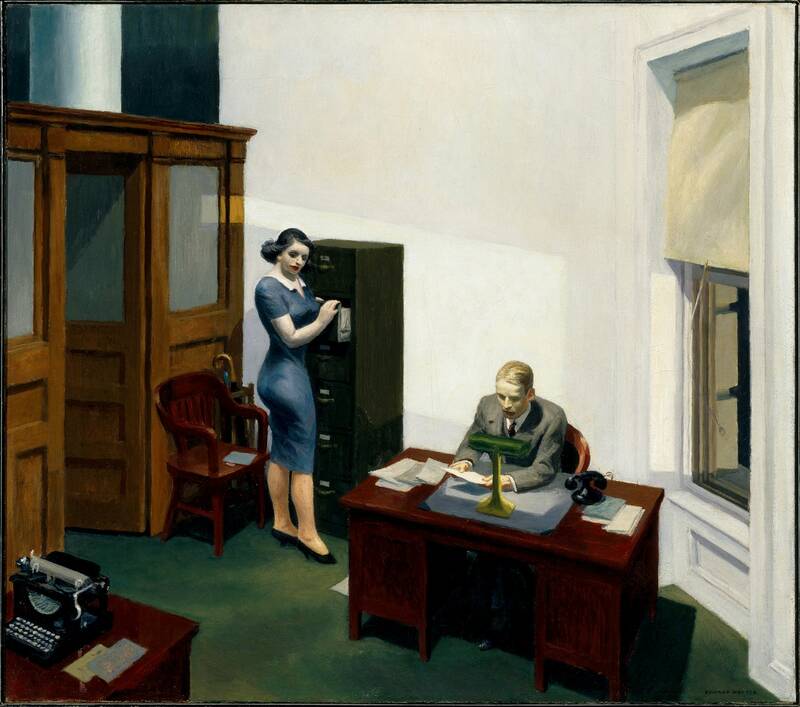 The picture shows a man sitting at a desk while a woman opens a file cabinet. In the sculpture, a man sits at a counter as a woman works the coffee machine. Engberg deliberately juxtaposed the pieces. "These two individuals in the sculpture are together in the same space, but they are not really together. She's not paying any attention to him. He's eating his meal," Engberg said. "And it's a similar situation to what's happening in the Hopper painting, where the office worker is doing her thing at the filing cabinet. The man isn't really looking at her. He's reading something at the desk. That kind of loneliness or isolation is something these two artists really share." Some of the portraits challenge the whole idea of portraits. Engberg points to one created by British artist Fiona Banner. "It's just a huge block of text on the wall. It's very hard to read. It goes on and on and on," she said. "And essentially it's her blow-by-blow description of a film by [director D.A.] Pennebaker about Bob Dylan." Like that film, the picture is called "Don't Look Back." Visiting "Five Ways In" is like going to a big party. You see old friends and meet initially obnoxious newcomers who may worm their way into your affections. All of the signage for the show is being translated into Somali and Spanish, and Engberg hopes local schools will bring students to see it. She says "Five Ways In" has a lot to offer in many different ways. "Maybe you just see something you haven't seen in years and are really happy to see again," she said, "and maybe you've discovered an artist that you've never heard of. So I would love people to just come away with something new." "Five Ways In" will be on display at the Walker Art Center through late 2021. That's a long run — so long that some of the works on paper will have to be rotated out to avoid problems with fading. That will allow Engberg to show a few more favorites.